Information technology today pervades scholarly discovery in the humanities, research in all areas of the sciences, and the processes of artistic creation. The “Pervasive” in the name IU Pervasive Technology Institute reflects the foundational importance of computer science, informatics, cyberinfrastructure, and information technology research to most of what is done in academia and industry today. Everything PTI does is based on a simple foundational belief: IU’s faculty, staff, and students are among the best and most creative in the world. Helping the IU community do what it does better, faster, bigger, bolder—and making the formerly impossible possible through informatics and cyberinfrastructure—means that PTI is advancing the important work of some of the greatest intellectuals and most wonderful creators around. In PTI’s quest to aid the US research community generally, all it has to do is look to its colleagues within IU to find the most important and challenging problems in the arts, humanities, sciences, and engineering. 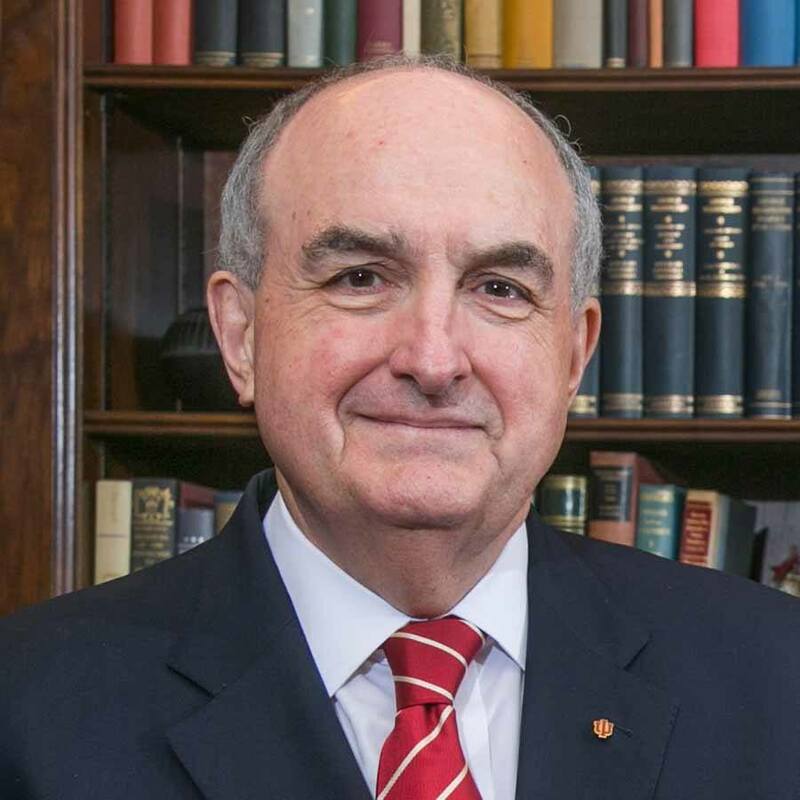 Solutions to these challenges are often found at the IU School of Informatics and Computing, which includes many of the best computer science and informatics experts in the world, and at the IU Office of the Vice President for IT, which includes many of the best cyberinfrastructure professionals around. 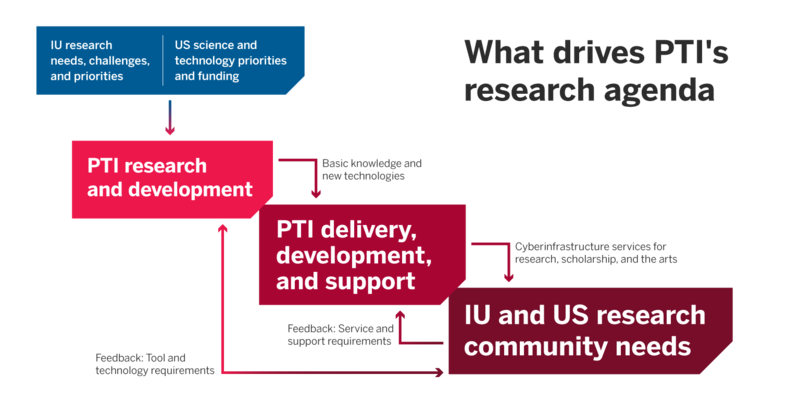 The diagram below shows how IU researcher (and scholar and artist) priorities drive the research agenda of PTI, which is also influenced by US federal priorities. PTI, in turn, influences US national research priorities based on what we learn from our IU colleagues. The result is a cycle in which IU artist, scholar, and researcher needs help drive the PTI research agenda, and then PTI transforms computer science, informatics, and cyberinfrastructure innovations into high quality and robust tools usable by the IU, national, and international research communities. Because these tools are developed and available here at IU, PTI creates a competitive advantage for IU researchers striving to accelerate research discoveries and aid US global research competitiveness … all while tackling problems ranging from human health to the impact of global climate change. Creating the Pervasive Technology Institute is the logical next step to securing our position of leadership in the information technology field and will serve as a catalyst to our efforts to expand all of our research enterprises within the university and state. PTI executes its mission through collaboration across organizational boundaries within IU, an innovative collaboration of the Office of the Vice President for Information Technology, the IU Maurer School of Law, the IU School of Informatics and Computing, the College of Arts and Sciences, and the Kelley School of Business. PTI serves as a way for faculty, researchers, librarians, IT professionals, students, humanists, and artists to collaborate to advance IU’s research, creative, and educational activities. PTI spans the spectrum of research, development, delivery, and support of new technologies in ways that cross collaborating units. PTI also becomes a locus for activity and collaboration beyond IU—serving as a point of contact for partners external to IU and a nucleus of new ideas within IU. PTI collectively operates outreach and training activities which reach thousands of people within IU and more than 10,000 people outside IU. PTI supports innovation within industries operating within IT. And PTI supports job growth in Indiana, bringing millions of dollars of federal grant funding to the state. See what positions are open within pervasive technology, research, and cyberinfrastructure. Search by keyword, or filter by all eight IU campuses. The PTI/RT annual report outlines IU community accomplishments related to several IU Bicentennial Strategic Plan goals and ongoing principles of excellence. The report is intentionally concise and focused on overarching facts and figures.